Before this film adaptation of August Wilson’s award-winning play Fences, another one was previously in the works with Norman Jewison, the director of In the Heat of the Night and The Thomas Crown Affair, attached to direct. The only reason it never got made in the end was because of Wilson’s strong insistence that any film version of his play be directed by a person of colour, instead of yet another white guy like Jewison. In retrospect, that makes sense because Fences is very much a play that has been, right from the moment it was first written, handcrafted for African-American talent to put their all into, not just with the acting but with the behind-the-scenes stuff as well, and any placement of a white guy like Jewison into one of those significant roles would probably have irked many liberal activists as yet another example of Hollywood whitewashing. And if there’s anything that Hollywood is more keen than ever to avoid right now, especially in the shadow of the #OscarsSoWhite backlash, it’s a seemingly biased appreciation of non-coloured talent that works just as hard as anyone else in the industry, yet never entirely gets the recognition they honestly deserve. Thankfully, we don’t have to worry about Fences being whitewashed anymore, as Denzel Washington has not only starred but also directed the resulting adaptation of Wilson’s play, and has cast a predominantly African-American set of actors to play the appropriate parts, while keeping the intimate feel of the setting as well as the intense drama that Wilson – who passed away in 2005 – originally crafted in a way that feels very different to a lot of stage-to-screen adaptations. As such, Fences is a powerful film with such engaging characters, tight dialogue, and – of course – amazing performances. Washington and co-star Viola Davis reprise their roles from the 2010 Broadway production of the play, as Troy and Rose Maxson respectively, a couple that lives a small and simple existence in the suburbs of Pittsburgh in the late 1950s. As it is in the play, Troy works as a waste collector with his friend Jim Bono (Stephen McKinley Henderson), and in his spare time reminisces over a failed career in professional baseball, which Troy insists was because of his skin colour instead of his age. Although when we first meet him he seems to be a charismatic and entertaining person, as the play goes on we learn more about Troy’s nastier habits, like intimidating his son Cory (Jovan Adepo) due to his own desires for a career in sport – something that makes Troy extremely jealous because his own son now has the opportunities he never had – and, in a major bombshell that amusingly made everyone at this particular screening gasp out loud, having done something that severely threatens his strong relationship with Rose. Like the play, Fences is a pure character study of a man whose bitterness over his past and inability to change things later in life soon causes him to lose everything he has gained over those years. Troy is a complicated fellow, one that you start off feeling comfortable around and yet there is still something off about this guy, like he’s using these highly personable skills around his friends and wife to mask the possibility that he’s hiding something from everyone. Sure enough, as we later discover when we see his nastier side, that turns out to be the case, and what Washington does as both an actor and a director that really makes the film particularly strong is to allow the audience to feel his growing cynicism and quiet disdain for life slowly but surely turn him into someone unrecognisable by the end. Needless to say, Washington is fantastic both as actor and director, as he really understands his character’s complex inner workings and does whatever he can to make sure that the audience feels his mighty fall from grace, both in his extraordinarily human performance and in his tight and intense direction. In addition, the intimate and even claustrophobic setting of this one particular house and its backyard really gives us an uncomfortable feeling that we’re trapped with this tragically monstrous figure, and the people who are forced to endure his wrath that ends up destroying their lives even more than his. You feel such sympathy for Rose, whom Davis plays with such a powerful sensibility in a tour-de-force performance that should easily confirm her status as one of today’s finest actresses, and who constantly has to deal with her husband’s rampant outbursts, brought about either by his own ego or by several outside occurrences, like his eldest son Lyons (Russell Hornsby) coming by to borrow some money, or the frequent disturbances of the peace caused by his mentally disabled younger brother Gabriel (Mykelti Williamson). If Troy is more or less the villain of the piece, then Rose is by far the unsung hero, even as her unconditional faithfulness to her husband is constantly being challenged with every passing development, and Davis with such envious ease allows us to feel her pain and inner torment while also letting us understand why she remains so vigilant and strong-willed despite all these horrible things happening around her. It is very much an actor’s movie, one that relies solely on performance to fully bring Wilson’s irresistible dialogue to life on the big screen, and by God the performances here are so strong and so layered with raw human emotion that the film is worth recommending based solely on how Washington and Davis bring their respective characters to life. It’s an adaptation that Wilson himself would have been ecstatic about, and for very good reason. 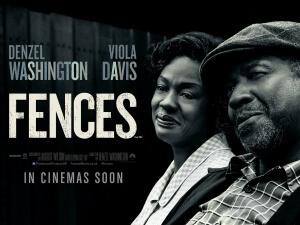 Fences brings playwright August Wilson’s play to life on the big screen in a powerful and emotional way, making it a strong film that is made even stronger by two fantastic performances by Denzel Washington, who also directs, and Viola Davis.